If you've followed this blog for the past year or so, you're familiar with the couple of us that are proponents of the "longtail" bicycle concept, whether used for touring, shopping, or just plain fun. We've put together a few longtail bikes, both using the Xtracycle attachment, as well as the Surly Big Dummy complete frame. A recent post on the Streetsblog site interviews Evan Ross, the founder of the Xtracycle company. It's a great background on the origin of the longtail bicycle concept and product, plus on the future direction of the company. "How much you wanna make a bet I can throw a football over them mountains?... Yeah... Coach woulda put me in fourth quarter, we would've been state champions. No doubt. No doubt in my mind." That, in case you don't recognize, is a quote from Dennis Quaid as Mike in the movie "Breaking Away." Hey guys! You're my home shop when I grew up in Medina. Just wanted to let you know that Xtracycle's founder's name is Ross Evans, not Evan Ross. 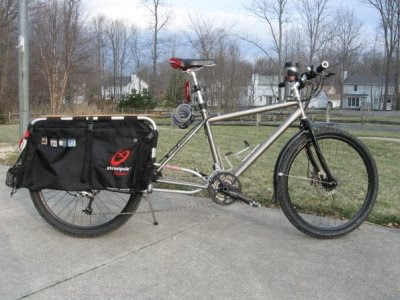 Also, Xtracycle is putting out some custom powdercoated Big Dummys! Hey, Jason! Oops, sorry about Ross Evans!